By Cathy Horsley, Bumblebee Conservation Trust Conservation Officer for the West Country Buzz project. An enormous bee with a 64 mm wing span that was thought to be extinct has been rediscovered this year. Wallace’s bee, Megachile pluto, was first known to science in 1859 when it was described by Alfred Russel Wallace. It was last seen in the 1980s, but was found recently by researchers to be alive and well on the Indonesian Maluku Islands. When insects are rare, or found in very specific types of habitat, they can go undetected; in this case for decades. 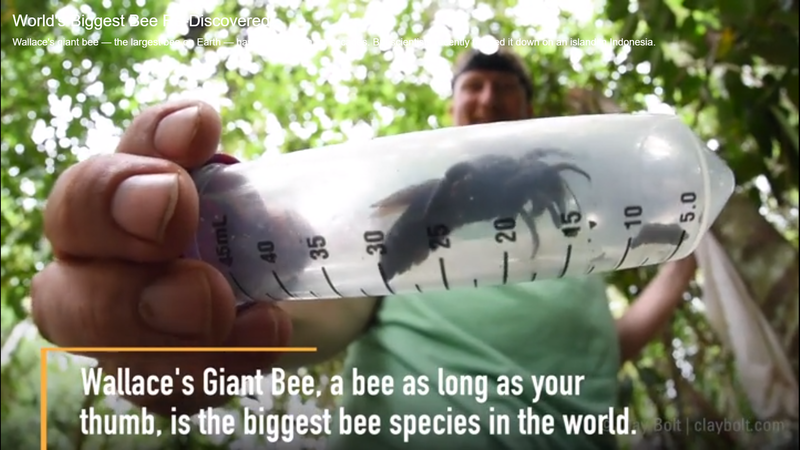 These giant bees, which in local folklore are known as “king bees”, have an extraordinary life history, living inside the nests of tree-dwelling termites. The mouthparts of the females are distinctively large, and she uses these specially adapted mandibles to cut pieces of tree resin to help make her home resistant to the termites. Females mix resin with wood fibres to construct tunnels and cells. Males have been observed to have territorial behaviour near to sources of resin, but have not been observed collecting any, nor being inside the nest. It’s not known if the bees are restricted to living with termites, but they have not been found anywhere else to date. When nests were dissected in a study by Messer (1984), there was no connection between the bees’ tunnels and the termites’ living quarters. Messer suggests that the association may be for protection against predators and parasites, or for a favourable microclimate. We have ten species of Megachile, or leaf cutter bees, in the UK, and there are around 1,500 species world wide. By comparison, our native Buff-tailed bumblebee queen, which is one of our largest species, is roughly 20 mm long. Find out more about this bee here. 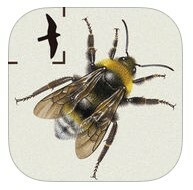 Field Guide to the Bees of Great Britain and Ireland. Steven Falk, 2015. Bloomsbury.